Alright, so my first big race of the year is just a few days away. I can’t believe the Cherry Blossom Run is here! It has been a very long road training for the Credit Union Cherry Blossom 10 Mile Run in Washington, DC. Every time race weekend arrives, I’m somehow surprised that I’m supposed to be able to pull this off! I’m really excited to be completing this race for the second time. Will I do a better job than last year?? I’m linking up with Annmarie at The Fit Foodie Mama, Angelena Marie at Angelena Marie: Happy, Healthy & Balanced, Michelle at Fruition Fitness, and Nicole at Fitful Focus for Wild Workout Wednesday! Check any of their sites to pick up some fun workouts to try! 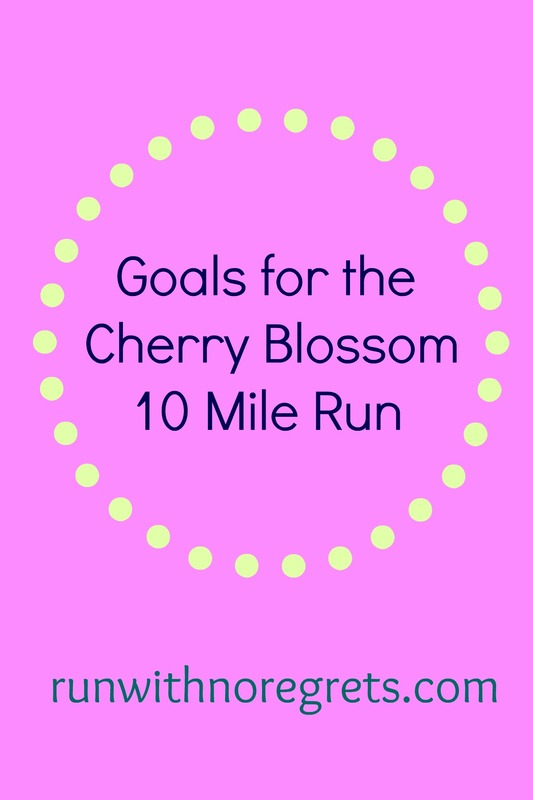 While I’ve already run a virtual 10K and a half marathon, the Cherry Blossom Run is the first big run of the year that I have been training for months. Have my music ready to go on Spotify – no fiddling with the controls. Start out wisely, the first few miles around 10:30 pace. Gradually pick up the pace after mile 5 and see if I can sustain it. Power up that hill and finish strong! Interestingly enough, when I ran RNR DC, I made it to the 10 mile mark in about 1:47. My best time for a 10-mile race was 1:37:42 way back in 2012. So I guess finishing somewhere between 1:38 and 1:45 would be ideal. We’ll see what happens! I have nothing groundbreaking going on with my fueling and hydration. As always, I’ll be sticking to my Clif Shotbloks every 3 miles. The race starts at 7:30, and while it will be a little breezy in the mid-40’s, it looks to be overall perfect running weather. 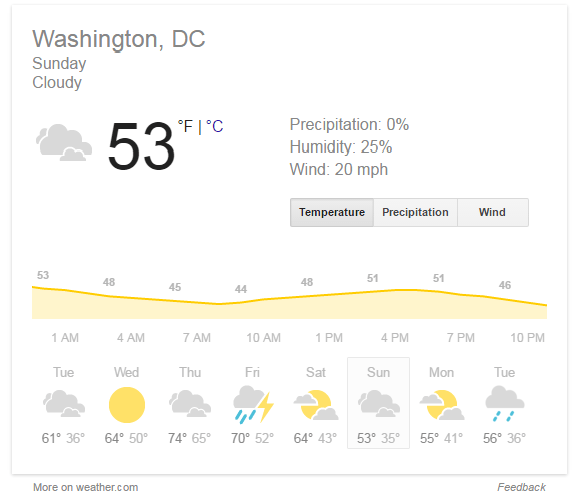 I still don’t know what I’m going to wear, but a long-sleeved shirt and capris should do the trick! A little chilly but pretty good running weather! While I have been practicing long runs using my Orange Mud Hydraquiver, there’s no way I’m going to risk losing my water bottle mid-run, so I will be using my Nathan hydration belt. It worked perfectly for RNR DC, so I shouldn’t have any issues. When I ran this race last year, it was tough getting water at the stations, so maybe my belt will save me some time! I am so fortunate to be one of the Social Runners for the Cherry Blossom Run along with Courtney from Eat Pray Run DC! Be sure to follow me on Instagram and Twitter as I keep you posted on all the fun happenings of Cherry Blossom weekend! Bret and I will be in DC all weekend and we’re really looking forward to having this mini-vacation. I’m also hoping to see some family and friends and who knows, I may have ONE drink before the big day, now that my Lenten sacrifice is complete! By the way, I have been fundraising for the Children’s Miracle Network Hospitals since becoming a Social Runner. Our team has raised over $2,000! I am grateful to have raised nearly $400 of my $500 goal, but I appreciate any additional support in these last few days! Every cent goes to sick children in need. Thanks for your support! Wednesday 3/23: 4-mile run with Bret. The weather was up to 70 degrees so the running trail was packed! I also had to avoid the bugs flying in my mouth and the allergy-inducing cherry blossoms. Still, we had a pretty good run! Friday 3/25: Another 4-mile run with Bret on Good Friday. It was actually a pretty speedy run, so I was able to practice that race pace. Will I be able to hold it for 10 miles? I’m not so sure about that! Saturday 3/26: It was an absolutely gorgeous day for a run…I wish I took pictures as it was so picturesque on MLK and Kelly Drive! Bret and I ran the loop for our last long run for Cherry Blossom: 9 miles! I have to be honest; it was a little rough at times, but I was able to finish stronger than when we started! Monday 3/28: Fitness classes at work are back in session! I had lunchtime yoga for the first time in 3 weeks and wow, I could really tell! We did a lot of work on our shoulders and I learned the Elephant’s Trunk pose which is super hard! I could hold it for a few seconds. Then I had boot camp in the evening. Vince worked us really hard, especially in the shoulders and back. Oh, and I realized my core needs LOTS of work. Use it or lose it! Tuesday 3/29: Easy 4 miles to taper before the race. I kept the pace super slow, which was actually really refreshing. Figures that I would push too hard in boot camp…every inch of me is sore! I’m extremely happy with this last week of running. Who doesn’t love a good taper? I only have one run left and then I’ll be resting up until race day on Sunday! I’m going to give Week 9, my final week of training, an A. Wow, what a journey! I’m extremely excited that the Cherry Blossom Run is right around the corner. I hope I can calm my nerves and have a strong race! Are you doing the Cherry Blossom Run this weekend? Let me know, I’d love to meet up!